Over the top? Maybe. I think I was born resistant and rebellious. I mean, I refused to come out for quite some time before they cut my mom open and drug me out. Why can’t we have artists like that? Artists who are real, and natural, and embracing it??? When I look at Lady Gaga, I always think that. It is easy to say that you’re different, and you want people to be themselves, but they can’t really look to you to as a role model of how to do that… when you are very typically beautiful, but you throw on a mask, some wigs, and a WILDLY OUTRAGEOUS garb to simultaneously negotiate and highlight the ways you fit into heteronormative beauty standards. You want to REALLY challenge us? Go get fat, or something. This also applies to Beyoncé, who has put out songs like “If I Were a Boy,” and “Run the World.” I feel like those songs are so manipulative, because they reinforce pretty horrible things while trying to play it off as though they are are challenging them. Also, Beyoncé… I saw you recently. You were blond. Please, stop sending the message that young black girls would be prettier if their hair was blonder and straighter. If you want to blow our minds for a minute… go all Erykah Badu with that shiz. I’m not saying all black women should go “au naturel,” but there are far more famous black women out there who look whiter and whiter every time I see them, and that’s not fair. I don’t even want to buy your CD, even though I think I’d enjoy it. I feel like I’d be buying into this whole market of people who DO know how to “fit into the mold” while claiming they don’t; or telling me to be myself, when I have no way of knowing the difference between who they really are, and what they portray. I miss more genuine representations of rawness and humility in music… the ones that don’t just claim things without the substance to back it up. That’s what I like about India Arie, Janis Joplin, Lauryn Hill, and Ani DiFranco… (sometimes p!nk, although she gets caught up in the marketing of it all too). I get that marketing plays that game of “Buy this, because you’re not good enough, and this will make you better,” but can’t we reserve that technique for make up, diet products, and plastic surgery? Can’t we let the voices and the music speak for themselves when selling MUSIC?!?! I don’t care what you look like, the only thing I want from music is inspiration. Music is SOOOOOOO POWERFUL. I get that it is a commodity, but can’t we just PLEASE get away from that for a while??? I want to look at musicians as ARTISTS, not just PERFORMERS. And I need to see women turn towards this model so much more, because the male artists out there have way more freedom to do it already. I want to see female artists who ARE themselves. Where is the market for that? I want someone who looks something other than perfect singing me a song that tells me that she loves herself as is, and wants others to do the same. You can say it all you want, but actions speak louder than words. I get that you want people to see YOU, Gaga… I get that you’re into the flashy thing… but a few minutes of crying about being bullied as a kid in a documentary doesn’t convince me. I’m not saying walk around all the time crying about it… I’m just saying that I need more time of real YOU, not masked, costumed you… just you. And yes, I realize that you naturally fit into a lot of preset beauty standards, and maybe the flashy garb is an attempt to negotiate that… I get that, and I can respect it. But, I KNOW you have days where you aren’t made up and costumed. I WOULD LOVE to see you like… in some effing PJ’s or something!!! Just relax!!! 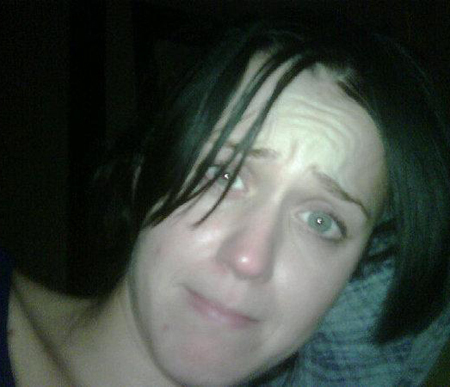 Russel Brand recently tweeted a pic of wife, Katy Perry without make up. She was horrified, and made him take it down, but I don’t know why. She was obviously caught off guard in the pic, but she was natural… and beautiful. I’m telling you, dear celeb women, you’re celebrities for a reason… you have something naturally already. Don’t feel so hard-pressed to dress it up and make it up like you aren’t good enough as is. How horrible do you think it makes us feel to see that even the most beautiful of women feel the need to hide within costume of what others think we should be? You know how they have those “DON’T GET GAS DAYS” when gas prices spike, as sort of a protest??? I would LOVE to challenge ALL CELEBRITY WOMEN to go out one day, and walk the streets with the paparazzi entourage following… in nothing but pajamas. No make up. LET US SEE YOU!!! OWN IT. Hiding yourselves doesn’t help you, and it doesn’t help other young women out there who look up to you. I know some of you have tried it in a photo shoot here or there, but it is safer to be without clothes and make up when you have lighting and a good photographer. Just saying. And yes, I realize that looking up to celebrities is stupid as it is. I GET THAT. Most people DO NOT. AND CELEBRITIES ARE IN OUR FACES ALL THE TIME… and I guess I’m just as sick of people selling lies as I am by the fact that we actually buy them. I’m done with my main point. But I’ll add a few perspectives, to open your mind. Here is a recent vloggity by Philip DeFranco (love of my life). I really appreciate this message, and I totally think more men need to say it just as much as women need to say it (and mean it). I do also realize, though, that it is very valuable coming from women who say it and live it… Mainly because so many of us, too often, look to men to validate our worth. Also, I realize that I’m not a musical person, and lyrics always hit me more, but I also appreciate the honesty of slam poetry… it is like music to me. Just a beat, and words. I know honesty isn’t totally marketable, but I wish it could be. I’ve posted my favorite slam poet, Buddy Wakefield here before, so this time, I want to share some slam poetry from an eclectic group of youths who are featured on HBO’s series “BRAVE NEW VOICES” which is presented by Russel Simmons.